On letterhead of the Corner House, Shortlands, R. O., Kent. 8 January 1887. 3pp., 16mo. Bifolium on grey paper. In fair condition, lightly aged, with slight glue staining at margin of second leaf. The letter begins: 'Dear Miss Anderson, | I did not write – though I conclude you have long been home – but you are always busy - & so am I.' She will not 'have finished her book' for another two weeks, when she will be 'free to think of other things'. Then she would 'much like to have a serious talk' with her 'about the play'. [ Dinah Maria Craik ('Miss Mulock', 'Mrs Craik'), English novelist and poet. ] 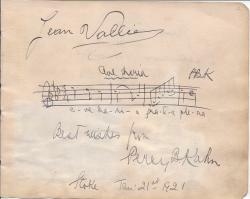 Autograph Note Signed ('D. M. C.') to 'A. E. W.', regarding 'a list of autographs'. Written lengthwise on front of a 9 x 15.5 cm. envelope. In good condition, lightly aged. Reads: 'A. 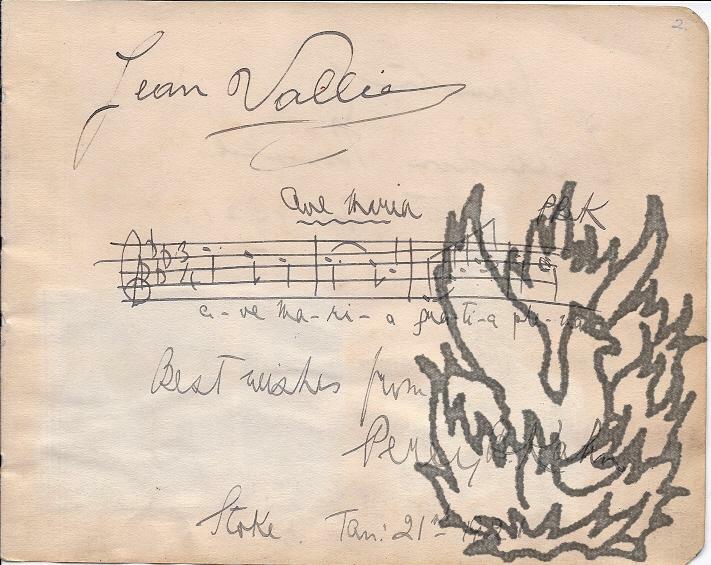 E. W. | I had a list of the autographs in thy literary collection but unfortunately have mislaid it. If there is a duplicate it wont make any difference because this is an uncessary little note of | D. M. C.' The page also carries annotations in another hand in light pencil. [ Lady Maria Theresa Lewis, author. ] Autograph Letter Signed ('M Theresa Lewis') to Sir George Scharf. Lathom House [Lancashire]. 22 November 1861. 3pp., 12mo. Bifolium. In good condition, lightly-aged. She is out of town, and Scharf's letter has followed her to Cheshire and Lancashire, and she is sending a letter of introduction to Lord Essex, whom she hopes will 'afford you every facility in your interesting pursuits'. She is flattered 'at the manner in which you always speak of my Grove Catalogue - it was a great pleasure to me & I much regret that other duties & occupations have prevented me for a time from continuing my Biographies'. She concludes by wishing him 'every success in your Blenheim Catalogue'. [Female suffrage; printed pamphlet.] Is the Exercise of the Suffrage Unfeminine? Published by the London National Society for Women's Suffrage. [The London National Society for Women's Suffrage.] Printed by Spottiswoode & Co., New-street Square, London. 1870. 12pp., 8vo. In good condition, lightly-aged, no wraps, disbound. With a few pencil annotations. A total of five copies on COPAC and OCLC WorldCat. No copy on market currently. [Pamphlets and Ephemera; Women and Education] A Collection of pamphlets and printed ephemera issued by "The Maria Grey Training College for Women Teachers established by the Teachers' Training & Registration Society" [found by Maria Grey]. Much printed by the Women's Printing Society, Limited, 66 Whitcomb Street, [London], WC 1892-1906 (some missing, see below). Seven pamphlets, unbound, 20-32pp., 8vo, one damaged but complete,another sl. chipped, others complete and in fair condition, with labels, numbers and stamps of the Board of Education, sometimes obtrusive. Dating 1892-3, 1898-99 (missing 1893-4 to 1897-8), 1899-1900, 1900-1, 1901-2-3, 1903-4, 1905-6. Contents listed on title as follows: 1. Council of the Society; 2. Objects of the Society; 3. Prospectus of the Training College; 4. List of Former Students (many of their later "appointments", jobs, listed). [Harriet Maria Gordon Smythies, Victorian novelist.] Autograph Letter Signed ('H. M. Gordon Smythies'] to a male correspondent, regarding the London publishers Darton and Company and the sale of her copyrights. 108 Stanley Street, Pimlico. 12 September 1862.
and I will let you know directly I find I can do so.' Darton's had published Smythies's books 'The Breach of Promise' and 'The Marrying Man'.